*As an Auburn fan, I’ll still always fear us getting the shaft no matter what system is in place at the time. It’s just too ingrained. That said, it would be pretty hard to keep an undefeated Auburn team out of a four team playoff, so this feels like a relatively safe statement. Forget what I just said about not claiming the title. A unanimous vote from the Eufaula Tribune is legitimate enough for me. Order the banners and update the sign over the scoreboard. Trib National Champs! I’ve been holding onto this one for a few weeks just waiting for the right time to use it in a post. With the focus on the 2004 season, there is no better time. Tommy Tuberville did an excellent job building and coaching that team and I will always hold him in the highest regard because of both the way his team played week in and week out and the class he displayed throughout the end of the season when it became clearer and clearer his team would be left out. He made the case for his team without ever coming across as a victim of the system or attacking teams ahead of Auburn in the polls. I’m not sure that I would have been able to identify this bobblehead as Tommy Tuberville without the AU logo and name printed along the bottom, but it makes a great collector’s item regardless. Not sure what year this was made and there are none available on eBay or Amazon to help with an answer. NOTE: There will be no jokes here about how this bobblehead just enlarged Tuberville’s head to fit his ears, no sir. As a man with ample auricles myself, I will not cast such stones. 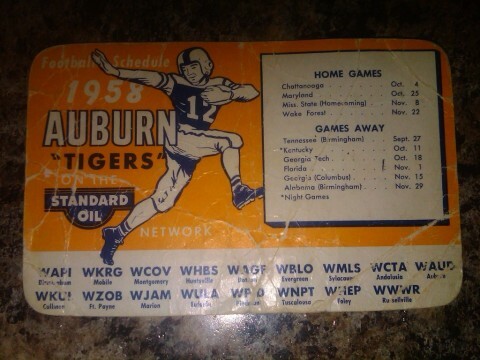 – 1958 pocket schedule that belonged to my grandaddy. He kept it in his wallet until he passed away in 1999. 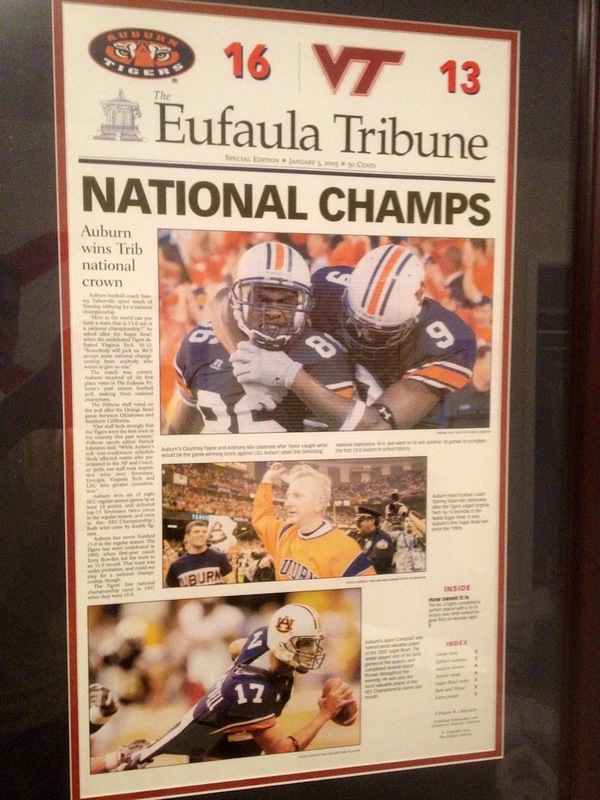 When I talked about Auburn’s lack of fanfare for the 1957 title a couple posts ago, this is what I was talking about. Here you have the 1958 football pocket schedule with nary a mention that the Tigers are the DEFENDING NATIONAL CHAMPIONS. Maybe it was different back in the day and it was seen as immodest to assert such things, but it seems to be a glaring omission when viewed through a modern lens. I’m a big, big fan of this jacket. 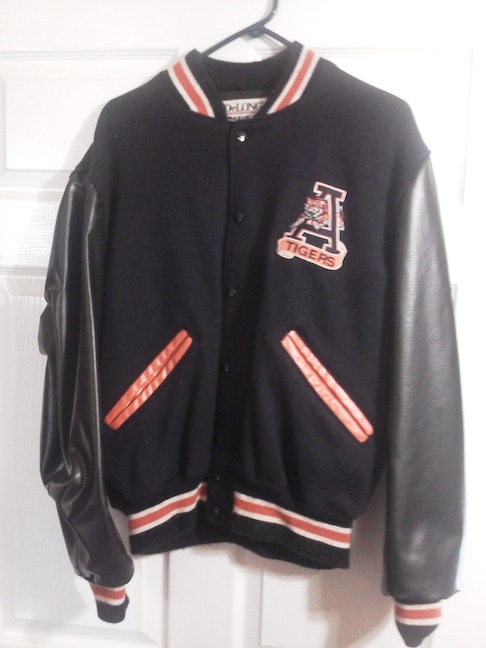 I like the old school lettermen jacket style and, of course, the Tiger through the A alternate logo. The AUBURN across the back just seals the deal. 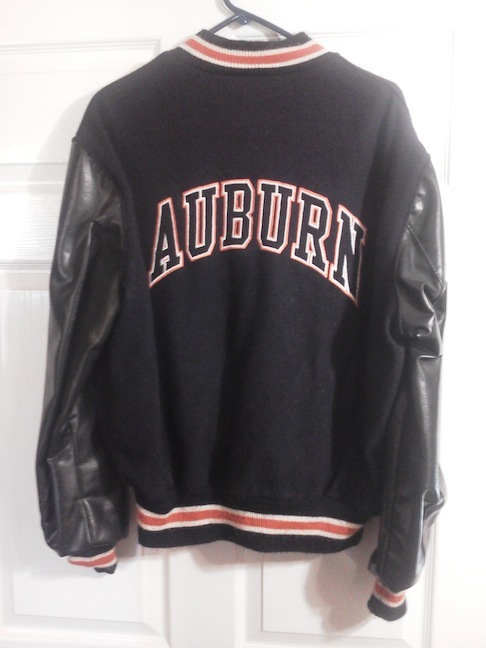 I’m now holding out hope for a classic ‘80s Auburn Starter jacket. 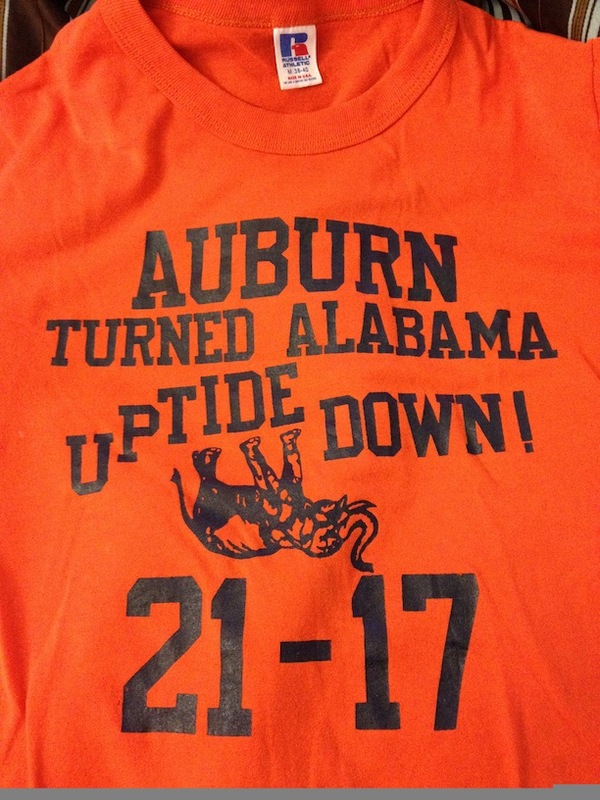 Long before there was a War Eagle Relics, there was a TWER post that would provide the inspiration for Charles to buy a T-shirt that would later become a relic. That is the circle of life. That will do it for this week’s edition. For editions past, go here. Thanks as always to our contributors. If you have something you’d like to share, email it to me at [email protected] or tweet me @FearlessandTrue. The Tuberville bobblehead was given away to students at a basketball game during the 02-03 or 03-04 season. 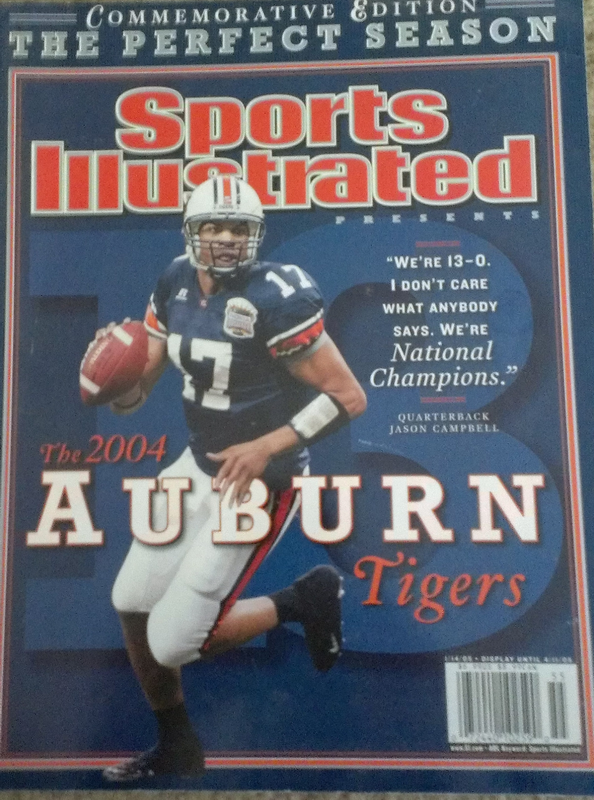 I have mine at my desk at work along with my Charles Barkley Auburn bobblehead that was given out the same year. They also gave away Cliff Ellis bobbleheads one game but mine went the way of Cliff Ellis. The 1958 Auburn Tigers opened with Tennessee in Birmingham and held Tennessee to -30 yards…that’s negative 30 yards of total offense and zero first downs in a 13-0 victory. That team, from top to bottom, was probably a better team than the 1957 National Championship team.